Q. Why bother with an inspection if the ducts are going to be cleaned anyway? A. Without an inspection, it cannot be assumed that an entire ventilation system requires cleaning. At a given point in time, there maybe areas of the ductwork that requires cleaning while others require monitoring only. An inspection answers important questions: how are the contaminants entering the system? What is the composition of the contaminants? Is the accumulation of particulate much higher in some areas of the system, and if so, why is it? With the video and laboratory analysis provided by an inspection, you are able to plan improvements to the ventilation system as well as budget for the specific clean air services that you require when you require them. Q. Does Ventcare clean acoustic lined ductwork? A. Yes. Bandy, our cleaning robot, is equipped with a variable-control apparatus which enables removal of the particulate without damage to the acoustic lining. Since Bandy is camera equipped, we can watch the cleaning process and adjust the pressure of the direct contact apparatus as required. Q. How does Ventcare clean vertical ducts? A. Vertical ducts are among the easier duct configurations to clean but we can't take all the credit. The natural force of gravity helps us in two ways: first, the solid particulate simply falls to the bottom of the shaft from where it can be removed on a horizontal pass-through; second, Bandy is lowered into the duct and direct-contact cleans its way from the top to the bottom of the shaft. Q. Is the ventilation system shut down during cleaning? A. No. We recognize that it is unreasonable to shut off heating in winter or cooling in mid-summer for ventilation cleaning. Ventcare solves the problem by cleaning the system sector by sector. As our crew moves to each sector designated for cleaning, the openings into and out of the defined area are sealed off from the rest of the system with pressurized foam gaskets. The cleaning does not interfere with normal operations elsewhere in the system. 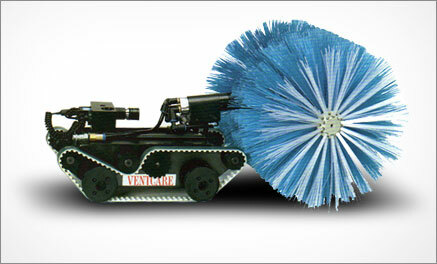 Recently, one of our client's building engineers informed his tenant "Ventcare is coming to clean the ducts". The tenant asked, "How will they do it?--Good Question! The diagram below was used to describe how Ventcare robot (BANDY II) brushes the particulate off the inside surface of the duct and how the HEPA filtered suction unit (WINTVAC) captures the particulate, protecting the workplace from contamination.